For Christmas, my son got me a lovely necklace. It is a silver pendant showing the golden ratio. What is that and why would I wear something like it? 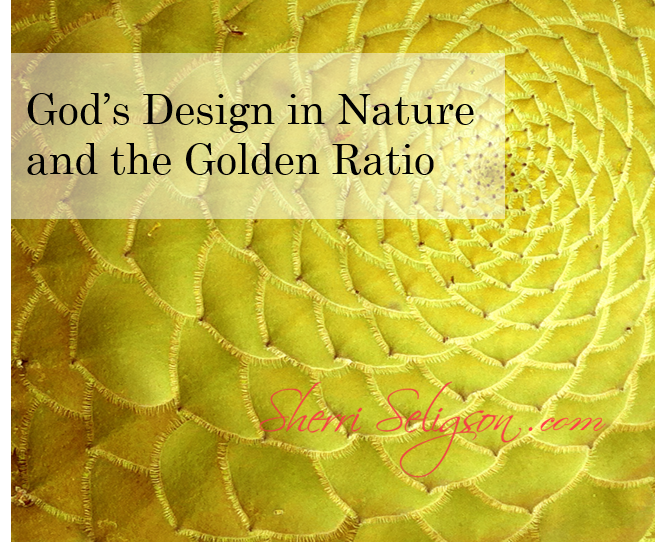 Well, to me, the golden ratio is a testimony to God’s perfect design. The golden ratio is a perfectly symmetrical relationship between two proportions. Numerically, it is about a 1:1.61 ratio, and it is most easily represented by increasing square sizes, beginning with two squares that have sides that are 1 unit in length, while the next square has sides that are 2 units in length. The increasing squares will have sides the length of the sum of the previous two squares. Mathematically, this ratio is closely related to the Fibonacci sequence, where each term is the sum of the previous two (1, 1, 2, 3, 5, 8, 13, 21…). Then you can see an increasing spiral that moves from the smallest squares to the larger ones. Historically, the golden ratio has been used in architecture and design because its proportions are pleasing to the eye. But to me, the most compelling examples of the golden ratio are found throughout creation. We see this perfectly increasing spiral formation in a nautilus shell. Cauliflower exhibits the same orderly proportions, too. And it is even seen in the ratios of the intricate webbing within delicate dragonfly wings. Did all this perfection occur randomly? That is hard to believe. Whenever we see order in the world, we should think of design. In fact, the more I study science, the more I see that there is an underlying foundational order to the universe. There are laws that the heavens obey. There is a noticeable pattern to the construction of the atoms within all the elements in the periodic table. You see, to me, all this points to a Designer. One who spoke all of creation into being. Glorious mathematical structures not only display beauty and artistic perfection, but they also point us to a Creator-God! And THIS is why I love my necklace!